With Italian Keratin , which is the strongest bond in the industry , this application does NOT use any heat and this ensures the health of you own hair. This application needs one maintenance check at 6 weeks, where any lose bonds will be replaced and then we will see you again at 3-4 months for the bonds to be removed. It is very important that you schedule this appointment as bonds work their way further and further down the natural hair as it grows. This can puts stress on the roots and can weaken the hair. No heat and no glue = no damage to your hair! This revolutionary NEW method is attached to the hair by tiny beads (which are undetectable) that are crushed flat, however, this requires maintenance every 6 – 8 weeks, to move any of the beads up the hair as it grows. This should only take a maximum of an hour, providing the correct after care has been followed. 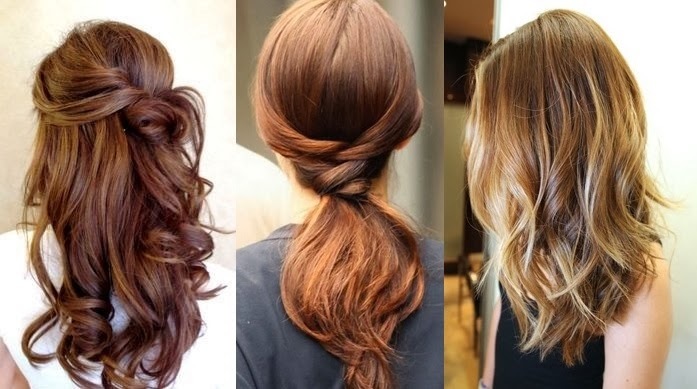 The advantage of this application is that you can keep the hair extensions in for as long as the hair remains looking good, although there is the ongoing cost for maintenance. Depending on what hair you choose the total annual maintenance charge can work out far less than the cost of a new set of extensions. Like Nano rings uses no heat, no glue and no chemicals. Small metal rings are applied to fine strands of your own hair; the extension hair is then clamped tightly inside the micro ring holding it securely in place. The micro rings come in a range of colours so they can be blended in with your own hair colour to ensure they are undetectable. Our micro rings are silicone lined to prevent the hair extensions from slipping whilst also offering a comfortable cushion to your own hair. Like Nano rings, micro rings can remain in the hair (with correct maintenance) for as long as the hair remains in good condition. Micro weft hair extensions continue to be a very popular method with clients, due to their affordability and ability to give instant length & volume. 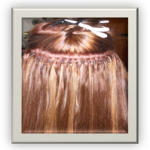 The weft is then applied and secured using micro rings along the length of the weft. Depending on how thick you would like the finished result; this method can take up to 2 hours to fit, a quick and effective way of gaining extra length and volume. 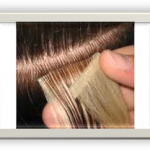 When the weft is first applied it will last between 6-8 weeks before any re-adjustment is required or removing. 4cm wide wefts sections are applied with the natural hair sandwiched in between. An incredibly quick method to fit, with a full head being fitted in as little as 45 minutes! The skin weft can last up to 6 weeks of continuous wear. At this stage the wefts are re-taped for the client, and re-applied using the same hair. 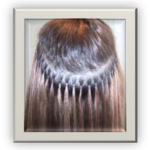 Unlike traditional weft application methods this hair can be worn up! 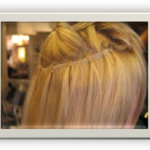 Providing maintenance appointments are attended and after care procedures are followed, tape wefts can last for several months. 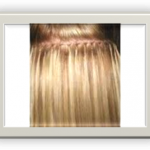 Removal is quick and easy and as with all of our methods, the hair is left undamaged.